“Wait? You can go anywhere you want in the Netherlands for free if you have a specific book? !”, which is what we asked our friends Maartje and Ingo at dinner one night. And, their answer was ‘yes’ with the explanation of why and how. To promote Dutch authors and reading the country allows you to use a specified book as your train ticket for a day. To get the book you just have to purchase another Dutch book for 12 euros or more. Then, on the official travel day, April 2nd, you use the book with its barcode on the back as your ticket. This year’s book was MAKKELIJK LEVEN, which Google translates to EASY LIFE. The author is Herman Koch, and in looking him up I discover his 2013 book, THE DINNER, was made into a Dutch film I saw; and, soon an American version will be released in the states starring Richard Gere and Laura Linney among others. NOTE: it’s a great story. I haven’t actually read THE DINNER nor could I read this new one since it’s in Dutch, but that didn’t stop us from getting two copies and picking an interesting destination in the Netherlands the furthest from Hoorn. 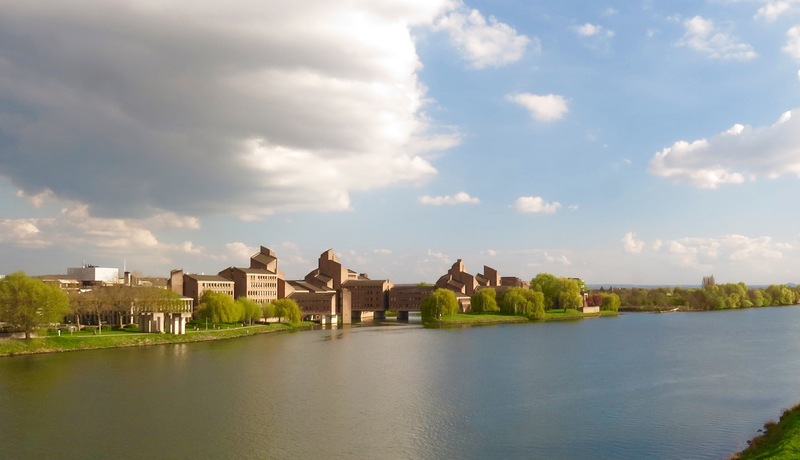 We chose Maastricht, an historic city nestled in the southeast toe of the country. 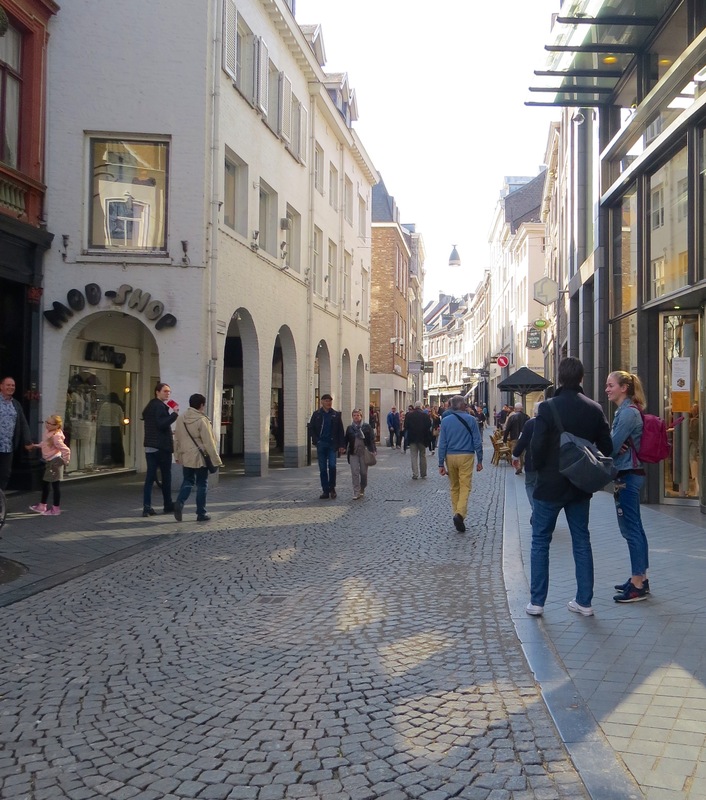 Maastricht, bordered by Belgium and Germany, retains a multi-European flavor having been captured over the centuries by almost all the European powers that be. As THE LONELY PLANET states, it’s thus appropriate it was here the treaty creating the EU was signed. We hadn’t ever thought of heading there, but, hey, for the price of two books we got train travel worth 100 euros and a new place to explore; so, early Sunday morning off we went to catch our train south and soon found out others had the same idea (you can just make out Koch’s book in a fellow traveler’s hand). Matter-of-fact by the time we reached Maastricht on our second train there was standing room only. A few hours later we exited the station in lovely spring weather and headed for the medieval section of town along with the rest of the horde. Having read about the city on our way here we knew there were some churches to check out as well as a fort. We were both surprised at how beautiful the city was, especially the old town with its cobblestone streets and gracious buildings. so we decided to peek in and were glad we did. It just happened to be the book store we’d read about called Selexyz n’Dominicanen. I could easily spend a good part of the day here perusing the shelves of new and used books with coffee intermissions at the cafe. A large plaza (Vrijthof) appearing down one street opened into a beautiful square lined with restaurants on two sides and churches and museum on the others. Whimsical statues danced in the plaza as we slowly twirled around for a 360º view. Referring to our guide book we spotted Sint Servaasbasilek, a building not difficult to locate since it’s the most imposing one in view. The church is named for St. Servatius, a 4th-century diplomat and bishop. He died here in 384 and his tomb is in a crypt under the church floor. He became saint of the Carolingians, the descendants of Charlemagne (b.740s, d.814) who was King of the Franks, the Lombards, and emperor of the Romans. Both Max and I believe it’s the oldest grave we’ve seen in Europe. passing the tomb of a Charlemagne descendent: Charles III (also called Charles the Simple, which means ’straightforward’ versus stupid), who lived 879-929 and ruled West Francia and Lotharingia. The church has evolved over the centuries, including hosting an imperial abbey with plenty of riches to go with it. A small room showcases some of the church treasures, a few being quite large chunks of gold. The most precious is the 12th-century Chest Reliquary or ‘Noodkist’, which contains what remains of St. Servatius and other bishops. During times of distress they’d parade this thing around. Now they do it every seven years, although I think they could make an exception and do it this year considering the world’s state of affairs and who’s in power. Religious decor surrounded us as we made our way through the church with the help of a detailed map. Even without much knowledge of this type of architecture and art, standing in the aisle you can just imagine how imposing this building must have seemed to folk coming to worship or pay homage to the guys in the basement. We felt the power and it’s not as if we’re what one would call true believers. Right next to Sint Servassbasilek stands Sint Janskerk. You can’t miss it with its bold red color. Being closed for the day didn’t stop us from admiring this perky, 17th-century Gothic church. Enough of churching it. We began walking towards another end of the plaza only to see a sign for a Taschen exhibit. I had just been gazing at some of his company’s art books when picking ones to purchase for our ‘book tickets’. Of course, being huge, glorious art books they wouldn’t have been the best choice for a boat library, but, still their books are stunning. And, here, right in Maastricht was a museum showcasing this publisher’s work. It’s a sign. Or, so I said. In we went, into the Museum Aan Het Vrijthof, a 16th-century building where Spanish King and ruler of the Netherlands Philip II (also, husband and then widower of England’s Queen Mary I) denounced his first lieutenant, Wilhem the Silent ( the founder of a free Dutch republic) during the Eighty Years War, aka, the war of Dutch independence (1568-16480. But, first, what else, lunch and a koffie/cafe next to the sky-light courtyard. I really didn’t know what to expect for my knowledge about this publisher was nil; however, I was soon presented with an informative timeline of the brilliance behind this Publishing Company, the German Benedikt Taschen. The timelines made for an easy bio of this man and his company (if anyone’s interested, I can email you the rest of them covering years through 2016). His first foray into books began at age 18 with the selling of new and rare, comic-book collections at Taschen Comics shop in Cologne, Germany 1980. Some success led to producing his own catalogues with collaborators Ludwig Konemann and Hubertus Roder. The focus on great comics didn’t translate into great sales, so in 1983 Taschen turned from anime to more traditional art. He bought up 40,000 copies of a book featuring Magritte in English, and 40,000 Germans snapped them up. By 1988 Taschen is selling fabulously printed books of all types of art for extremely low prices by controlling distribution costs. His books reproduce art to the nth degree; and, even if I don’t like the subject (one room displayed photos of deadly car crashes) I can’t help but appreciate the quality of his printed works. When I espy one of his books all I want to do is open the cover and reverently caress the pages as gorgeous image after another reveals itself. Yet, not everyone was as taken with the exhibit as I was… Don’t worry: he was just sleeping. Discovering there are 13 Taschen stores, I noted one is in Amsterdam, a store which is definitely on my ‘to-visit’ list. Satiated with Taschen we continued to wander through Maastricht just absorbing the european air of this old city. Yet another church caught our eye, the Onze Lieve Vrouwebasiliek with some parts dating from the 11th century. 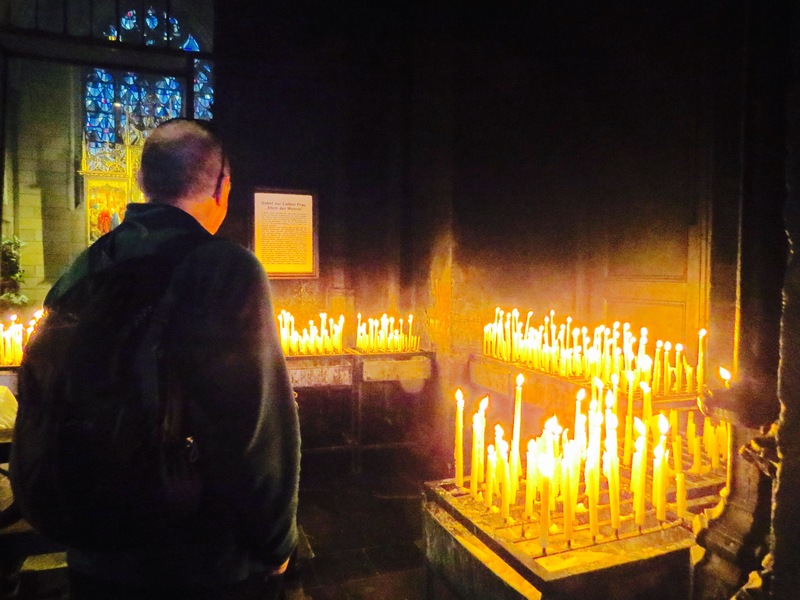 When we entered we found a candle-lit shrine honoring Mary Star of the Sea (traditional title for Virgin Mary) and a pilgrimage destination. we continued our leisurely stroll passing some eye-catching graffiti close by. Once we had id’ed our location, we crossed the Maas River, which gave us some of our best views of the day. Our last stop was on the east side of the city at Fort Sint Peter built by the Romans and reconstructed based on how it looked in 1701. The fort sat atop limestone hills originally mined by the Romans for building blocks. In later years the resulting tunnels and caves became places of refuge and escape routes during battles. By the time we reached the site everything was closing, but it was a beautiful day; and, it being rare to stand on a hill in the Netherlands, the mini-climb was still worth the exertion. only to join many of the same crowd with whom we’d travel this morning. This time we sat opposite fellow passengers actually reading the Koch book. I would have asked how they liked it but didn’t want to interrupt their enjoyment. A few hours later we’re back at the start of our journey and truly thankful we had booked it to Maastricht for that city is definitely worth a visit or two! 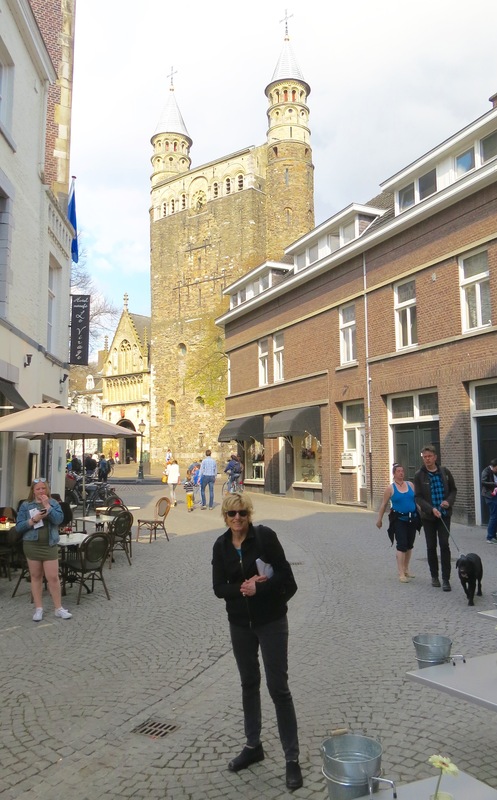 This entry was posted in 2017 04 NETHERLANDS, 2017 Winter Tours, COUNTRY, Europe, Netherlands, WINTER TOURS and tagged Book, Museum, Servatius, Taschen on April 27, 2017 by margaretlynnie. very cool, you really made the most of it ! !….btw, the surfing taschen book of surfing has my sister in the centerfold…. she won the 1962 Huntington Beach contest !….funny you should have the book open, featuring Linda Benson…also a close surfing acquaintance from yesteryear !…enjoyed your travels…thanks again. What a great tale! You look great in your trendy tight jeans. Very European! You guys are so cool! How Bert is it travelling all the way across a country just by buying a book. You should have learned Dutch by now tho We have opened Sleeth for 2017. Beautiful here. Hope to see you both in August if timing works out. Ahh, Sleeth! Youall must be thrilled to be there. Don’t think we’ll make it but hope to see photos!